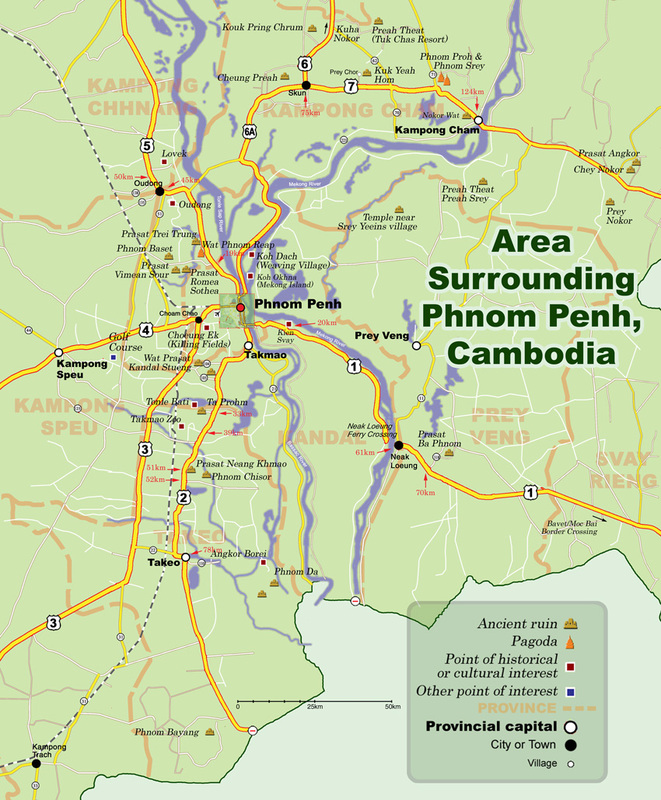 There is a lot of Cambodian history and culture within a daytrip’s distance of Phnom Penh. The pre-Angkorian and Angkorian-era temple ruins in Takeo province, though not as impressive as the ruins near Siem Reap, still rank amongst the most historically and archaeologically important Khmer ruins in Cambodia. Of a much later era, the picturesque 17th-19th century remains of the royal city of Oudong west of the Phnom Penh allow you to explore the period of Cambodian history between the end of the Angkorian-era and the beginning of the French colonial period, an age that is neglected in most tours of the country. And just the process of getting to these sites provides a good glimpse of Cambodian countryside life - scenic rice paddies, stilted villages and countryside pagodas. Most of the places listed are too far for a tuk-tuk from Phnom Penh. Easiest to arrange a tour or transportation through a travel agent or your hotel, usually a daily tourist van. DYI options include chartering a taxi, renting a motorcycle or taking a public bus to the nearby city and ask to be let off at the site.